This blog describes to some level of detail how I created my first AWS Lambda function (https://aws.amazon.com/lambda/). You are about to embark on a steep learning curve. Defining and executing a AWS Lambda function (in short: function) is not only typing in the function specification, its implementation and then invoking it. A lot more is involved – the below blog provides a general flow (not a command-by-command tutorial – for that several references are provided). A client invoking a function does so via the API Gateway. For the function to be executed, its implementation has to be provided. When using Java for the implementation, the implementation has to be uploaded in a specific packaging. Identity and Access Management (IAM) governs various access points from a security perspective. Aside from the function implementation everything can be specified on the AWS web page. The function implementation is uploaded by means of a defined packaging. All specification and definition activity takes place in context of an AWS account. If you don’t have one then you need to create one. Chances are you purchased an item on Amazon before; in this case you have an AWS account already. Initially I setup two users. One called “apiDev”, and a regular user. Then I created two groups “apiDevelopers” and “apiUsers”. apiDevelopers has the policy AdministratorAccess assigned. This allows apiDev to create all artifacts necessary to implement and to invoke a function. I logged in as apiDev for creating the function and all necessary artifacts. The group apiUsers has no policy assigned initially, however, it will get a (function execution) policy assigned that is going to be specifically created in order to access the function. This establishes a fine-grained permissions allowing the users of the group to execute the function. The function definition is separate from the function implementation. A function is created without it having an implementation necessarily at the same time. In my case I am using Java and the implementation has to be uploaded in a specific packaging format; and that upload is distinct from specifying the function in AWS Lambda. A function definition consists of a name, the selection which language (runtime) is going to be used as well as an execution role. The latter is necessary for a function to write e.g. into the Amazon CloudWatch logs. However, a function specification does not include the function parameters or return values. A function specification does not contain its signature. Any input/output signature specification is absent and only the code will contain the authoritative information. The phrase “creating a function” can therefore refer to different activities, e.g., just the function specification in AWS Lambda, or including its implementation via e.g. an upload. The instructions for creating the function and its implementation is here: https://docs.aws.amazon.com/apigateway/latest/developerguide/api-gateway-create-api-as-simple-proxy-for-lambda.html. I chose the execution role lambda_basic_execution. As a side note, AWS Lambda is different from anonymous lambda functions (https://en.wikipedia.org/wiki/Anonymous_function). Being an Intellij user I created a separate project for implementing the function. It turns out the easiest way approaching the function implementation was to create a gradle project from scratch using the Intellij project creation option for gradle, and then fill in the AWS function implementation (rather starting with the function implementation and trying to turn it into a gradle project afterwards). Once the function is developed it has to be uploaded to AWS Lambda in form of a specific packaging. The process of creating the corresponding zip file is here: https://docs.aws.amazon.com/apigateway/latest/developerguide/api-gateway-create-api-as-simple-proxy-for-lambda.html#api-gateway-proxy-integration-lambda-function-java and here: https://docs.aws.amazon.com/lambda/latest/dg/lambda-java-how-to-create-deployment-package.html. The upload only happens when pressing the “save” button on the AWS Lambda page and it’ll take a while as the package tends to be several GB. Once uploaded one or more tests can be defined on the web page and executed. While this is not a practical unit test approach, it allows to execute the function without an API Gateway integration in place. Note: this screen dump was taken after I integrated the function with the API Gateway; therefore the API Gateway trigger it is displayed in the UI. One way invoking (“triggering”) a function is via the API Gateway. This requires the specification of an API and creating a reference to the function. The simplest option is using the proxy integration that forwards the invocation from the API Gateway to the function (and its implementation). The instructions for creating the API in the API Gateway and its implementation is here: https://docs.aws.amazon.com/apigateway/latest/developerguide/api-gateway-create-api-as-simple-proxy-for-lambda.html. I chose the Lambda Function Proxy integration. An API specification must be deployed into a stage in order for it to be accessible. Stages are a mechanism to e.g. implement the phases of development, testing, or production. Analogous to AWS Lambda, the API Gateway also allows direct testing within the web user interface and this can be used for some initial testing (but is not feasible for integration testing as it is manual). Once the relationship between the API definition in the API Gateway and the function is established via resource specifications, the function can be invoked from external to Amazon using e.g. Postman. Note on security: by default the API is not secured, meaning, everybody who knows the URL is free to call it and invoke the associated function. https://docs.aws.amazon.com/apigateway/latest/developerguide/permissions.html This differentiates accessing the API definition and invoking an API. For invoking an API I created a policy and attached it to the group apiUsers. Any user within this group is allowed to invoke the API that I created. In addition, I set the authorization to AWS_IAM (see above figure) and that means that the invoking client has to provide the access and secret key when invoking the API. The function in AWS Lambda is secured using a function policy that can be seen when clicking on the symbol with the key in the AWS Lambda user interface. In my case is states that the API Gateway can access the function when invoked through a specific API. Note (repeat from earlier): when defining an API in the API Gateway access is open, aka, anybody knowing the URL can execute the function behind the API. While the URL contains the API identifier (and that is randomly generated) and highly unlikely to be guessed, still, access is open. Once the access policy is defined and put in place, access will be limited according to the policy. However, access restriction is not immediate, it takes some (short) time to become effective. In order to invoke the function, a client (in my case Postman) requires the URL. The URL can be found when clicking a stage in the Stages link in the API Gateway UI. I opted for the IAM authorization using access key and secret key. That needs to be configured in the authorization setting of Postman (it also requires the AWS Region to be specified). No additional headers are required. As I have defined a POST method, the payload has to be added as well. In my case this is a simple JSON document with one property. Once the invocation is set up, and once a few invocations took place, the API Gateway Dashboard will show the number of invocations, errors, etc., separated for API Gateway as well as Lambda functions. Defining the first function is an effort as many pieces have to fall in place correctly for it to work out and many mistakes will happen most likely along the way. However, the ecosystem is quite large and has many questions already answered; in addition, AWS has a lot of documentation, which is mostly accurate (but not quite 100%). The first function, as defined above, now gives me a jump-off platform to investigate and to experience AWS Lambda functions further. Stay tuned for many more blogs that explore a huge variety of aspects and concepts of serverless distributed computing. 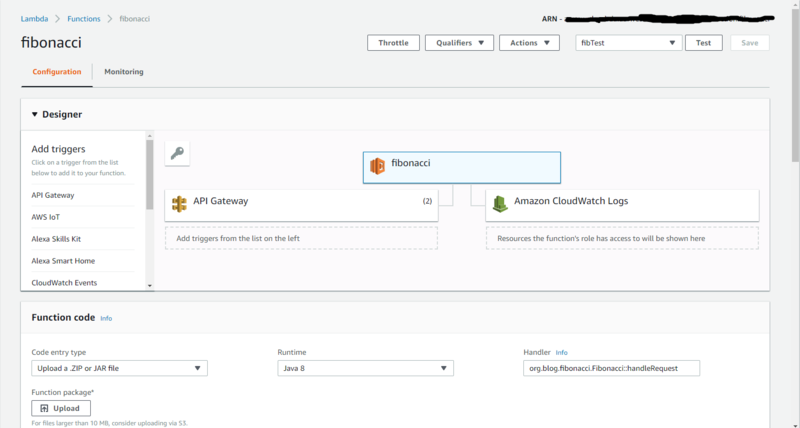 This entry was posted in Computing Technology, Serverless Computing and tagged Amazon CloudWatch, AWS API Gateway, AWS IAM, AWS Lambda, AWS Lambda Function, Functions, Serverless Computing. Bookmark the permalink. ← Serverless Computing: What is it?